I must give credit for the vision, direction and overwhelming success of this project to my God and Father. 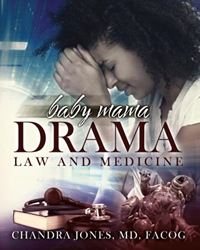 Dr. Chandra Jones’s new book, Baby Mama Drama - Law and Medicine, ($16.99, paperback, 9781498439152; $8.99, e-book, 9781498439169) spins her real life professional and personal experiences into a dramatic read. This book is entertaining, educational and raises health awareness. Readers will follow the main character’s every move as she faces critical, lifesaving decisions for both expectant mothers and unborn babies. At the same time Dr. Jones is saving the lives of others, she is also facing her own unexpected serious medical condition. Readers will relate with Dr. Jones’ health crisis along with her very stressful and emotional life. This book is much more than a story about doctors and patients. Instead, it’s a story of life, death and tragic, unexpected events. It is page-by-page drama and readers will excitedly want to see what happens next with each new chapter! “I must give credit for the vision, direction and overwhelming success of this project to my God and Father,” states the author. Dr. Chandra Jones is a Maternal Fetal Medicine and Critical Care Specialist in the field of Obstetrics and Gynecology. She has received many academic accolades. She was honored as an OB/GYN Citizen Ambassador to Egypt, China and Israel. She has also been honored as a United States OB/GYN delegate to the South African OB/GYN conference in Capetown. TV host, Steve Harvey, honored Dr. Jones as an “influential Afro-American" on his television show. Her most cherished distinction came from Bishop TD Jakes of the Potter’s House in Dallas, Texas. Dr. Jones has also served as a healthcare provider for Megacare in Johannesburg. The conference ministered to over 80,000 people at Megafest International with healthcare providers servicing 4,000 individuals in 2 days. Outside her medical practice, she enjoys public speaking and has a passion for spiritual reading. Her vision is to one day share her medical expertise on the small and large screens – as an outreach of entertainment, health awareness and education to all. Xulon Press, a division of Salem Media Group, is the world’s largest Christian self-publisher, with more than 15,000 titles published to date. Retailers may order Baby Mama Drama - Law and Medicine through Ingram Book Company and/or Spring Arbor Book Distributors. The book is available online through xulonpress.com/bookstore, amazon.com, and barnesandnoble.com.